Earlier this year Brigitte Garvey bought classes from Evelynne Joffe’s Living the Tree of Life course to deepen her knowledge of the Kabbalah. Her reason for doing so is fascinating! Brigitte, or Madam Kali as she is known, is creating a spiritual system that connects sound healing with the sephirot and paths on the Tree of Life. For the last seven years Brigitte has travelled the world to learn, first-hand, about ancient healing practices. 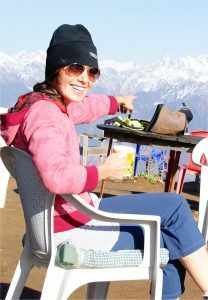 She has strong connections with shamanic healers in Peru and in Nepal where this photo is taken. Visit Madam Kali’s website to see the wide range of singing bowls, ting shas and chimes that can be used for healing and relaxation purposes (worldwide shipping available). There’s a guide to choosing the best bowl for your purposes and information about Madam Kali’s shamanic therapy sessions. In the video gallery you’ll also find free videos on learning to play a singing bowl, aura fortification and crown chakra stimulation. LINDA: How does sound produce a healing effect? MADAM KALI: Sound is essentially vibration which is perceived primarily through our ears yet we also perceive sound through our skin. Sound research pioneer Alfred Tomatis discovered that when received by the ear the sound literally charges the brain. The reverberation on the small bones in the ear can be responsible for putting the entire cranium into resonance. In turn this process mobilizes the complete nervous system affecting muscle tension and the position of the body. His ground breaking research revealed on a scientific level just how potent the influence of sound is on our bodies and mind. Yet if we venture into the more mystical realms we discover the wisdom of ancient creation myths which identify the evolution of creation emerging from principal seed sounds which correspond to primary elemental energies. Specific references are made in both ancient Kabbalistic and Vedic (Hindu) texts. The Kabbalah describes the original sounds as the 3 primary mother letters, corresponding to the primary energies of water (Mem), fire (Shin) and air (Alef). Together they form the three pillars within the infrastructure of the Tree of Life which is a macrocosmic manifestation of that which exists within the human being. So in a sense it could be said that the pillars themselves are derived from sound and so too are we. The Tibetan bowl has its historical origins in the regions of Nepal and India where the Hindu and Buddhist religions are most prevalent. Both of these religious cultures revere the divine principle of sound both for its role in the creation of the universe and as a vehicle towards enlightenment. The Hindus believe that as creation began, the divine all-encompassing consciousness took form first in the original vibration manifesting as the sound “OM”. Buddhist practice applies the use of mantras to both focus the mind and transmute negative energy so one can enter higher states of consciousness. So whether we come from a scientific or mystical perspective it is hard to deny that sound can have a potent effect on our bodies, mind, emotions and spiritual states of consciousness. Over the last decade or so the Tibetan singing bowl has received particular attention for its capacity to have a positive impact on our wellbeing. As a polyphonic instrument, a quality hand-beaten bowl is unique in that it is able to emit several different frequencies in one moment of time. As our body mind receives these layered frequencies it tends to guide one into an altered state of consciousness with gentleness and ease. When the body mind settles in an expanded consciousness healing can take place on all levels. A person may experience this through a relief of physical pain, a release of emotions, a calming of persistent mental thoughts or a spiritual journey into the unconscious realms of the personal self or greater cosmological sphere. LINDA: It’s easy to see how sound helps with altering emotional states, but what about physical symptoms such as back pain, sore muscles and so on? MADAM KALI: Often physical pain can have its origin in an imbalance of the hormonal, nervous or digestive systems. These systems are finely tuned and can be easily disturbed through a negative state of mind and lifestyle habits. As I said before, the vibration of the singing bowl can evoke an expanded consciousness in which healing can take place. In this state these finely tuned systems can spontaneously come into balance and alignment in turn alleviating the pain. Visions received during a singing bowl healing can also provide insight and release of unresolved emotional pain resulting in greater physical health. LINDA: How does the mainstream medical profession view sound healing? Are doctors open to a holistic approach that could include sound healing? MADAM KALI: I am aware that the singing bowl is becoming increasingly popular as a tool in the areas of mental health, aged care and special needs. Many health care professionals in these arenas are enthusiastically utilizing the bowl in varying creative capacities to help their clients. As for the mainstream medical profession, at one stage I was facilitating singing bowl meditations in a mindfulness program run by a widespread psychologist practice in Melbourne. The workshops were aimed at managing anxiety and depression and the bowl was introduced as a tool to enhance mindfulness. Whilst I was required to keep the content of the presentation within the parameters of modern science there was a tremendously enthusiastic response from the participants and psychologists as to the value of the bowl and its ability to assist in the management of anxiety and depression. I think in Australia sound healing is being embraced by the mainstream medical profession more in the areas of mental health as opposed to physical health. However, in Germany, United States and some other progressive countries in Europe sound healing is now being drawn upon as a respected modality within the medical profession as a whole. For those interested in exploring more the application of sound healing in the case of cancer and critical ill patients there is a book named the “Healing Power of Sound” by Mitchell Gaynor MD. Dr Mitchell is based in the United states and since 1991 has used several sound based techniques including singing bowl therapy in the treatment of critically ill patients. The book includes numerous studies demonstrating the heath benefits of music. LINDA: You have a number of qualifications in alternative health modalities, what led you to specialise in sound healing? Madam Kali with Shipibo Indians in the Amazon region of Peru. the Ayahuasca ceremony is one of the ancient shamanic traditions they practise. MADAM KALI: Some time back I began to see a pattern of interest in the health modalities I was studying in Australia and I realized all these systems had there roots in ancient healing practices and theory. Since then over the last seven years my personal healing search has led me to a much deeper investigation of these healing systems at their core as I have spent time with indigenous healers in the regions of Bali, Thailand, Sri Lanka, Nepal, India, Brazil, Chile and Peru. Through my experience of travelling the world and discovering ancient healing practices what has been revealed in all traditions is a reverence towards nature and the power of the elemental forces. It has been my observation that within these indigenous healing practices the medicines of the earth are used in combination with sound, touch and movement to heal the body and mind. These traditional methods go beyond the superficial levels and get in touch with the primal forces of nature within the macrocosm of the universe and the microcosm of our individual selves. I find this work very powerful enabling us to transform our illnesses at the core in a truly holistic way. The application of sound has a potent and direct effect at a vibrational level and can be used to penetrate the many tiers of the self in turn liberating the frozen layers of our shadow. Madam Kali with one of her favourite Peruvian Shamans! LINDA: You’ve also studied and experienced South American shamanic healing practices…what role does sound play in their ceremonies and practices? MADAM KALI: Sound is an essential component of the shamanic healing practices. Traditionally the songs the shamans sing in ceremony are taught to them by the plants themselves. During a ceremony the shaman will invoke various plants spirits through sacred songs known as Ikaros. In addition to the Ikaros, the shaman uses a rattle to maintain a percussive beat throughout most of the ceremony. The sound of the rattle invokes a trance state as the plant spirits work energetically on the participants. The plants spirits are often described by the shamans as mini doctors. In Peru the shaman makes his own percussive instrument out of leaves from the sacred Chakapa plant in the amazon. There is a deep entwinement in this tradition between the application of the healing master plants and sound within a ceremonial context. Song essentially is the language of the plants. Over the last four years I have spent a significant amount of time immersed in the healing practices of Amazonian Shamanism in South America. It has been a truly profound journey of discovery in every way possible. I have had the honor of playing the singing bowl in the sacred plant medicine ceremonies throughout Brazil, Chile and Peru. The South American people have shown great intrigue towards the singing bowl for its healing vibrations and mystical origins being from the far away lands of Nepal, India and Tibet. LINDA: In the Heart Connection video included with the love and relationship set of singing bowls, you demonstrate how a singing bowl can be used to improve relationships with loved ones. What sort of feedback have you had from people who have used the bowl and ting shas for this purpose? MADAM KALI: Over the years I have had many husbands contact me in search of a singing bowl for their wives. I sensed that for some men it was not easy to understand the more elusive spiritual world of the feminine but the bowl was a means through which they could connect on this level with their partner or at least show their support. In a sense the singing bowl is able to act as a conduit of love between two people. The intentionality behind gifting a loved one with a bowl is very sacred and can imply in and of itself an invitation to deeper levels of intimacy, peace and compassion within a relationship. I find when a singing bowl or set enters the life of an individual, couple or family it takes them on a spiritual journey together. As each bowl is infused with a particular energy the journey will usually be oriented around the themes presented by a particular bowl or set. LINDA: Your base alchemy set of bowls includes a video about using singing bowls to generate a self-healing process. Again, what sort of feedback have you had from clients? MADAM KALI: Yes I think the singing bowl is an ideal tool to accompany one on a self healing journey. The bowl is versatile and can be utilized in a variety of ways for this purpose. It is not always convenient or cost effective to visit therapists and practitioners for support or even friends and loved ones are not always available when we need them. Having a bowl to play in times of distress or discomfort can provide a sense of solace and immediate calm. I have had ample feedback from clients over the years whereby the bowl has provided a successful aid in bringing a sense of richness and depth to their lives. In the video series I show how the bowl can be played on the body for self healing and also the power of working with the bowl with clear intent to manifest our heartfelt prayers and desires. I have experimented with these techniques extensively in my own life and found them to be very successful. 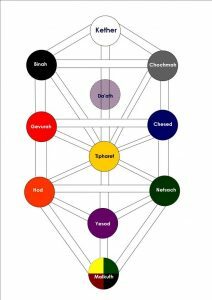 LINDA: An intriguing aspect of your approach is the integration of Kabbalistic principles into the system, with each bowl representing a sephira on the Tree of Life. Tell us a bit about how you came to take this approach. MADAM KALI: In 2012 I discovered the incredible quality bronze hand-beaten bowl which are the bowls I have combined the Kabbalistic system with. When I first began experimenting with these bowls back in Australia I began to sense that each bowl was emanating particular qualities and together they made a complete spiritual system. It was around this time that I had been delving more deeply into my study of the tarot archetypes that I decided to study the Kabbalah. In the first session as we were introduced to the Tree of Life and the sephirot it dawned on me that this was the very system I had been intuiting with the premium bowls. The Kabbalah teachings gave me access to this incredibly valuable occult knowledge both through the literal receiving of the information and through some kind of spontaneous energetic transmission or initiation which I experienced throughout the course. With all the wisdom that the Hindu tradition brings through its understanding of the chakra system I always had the sense that it was incomplete, the Kabbalah knowledge brought this depth and complexity I had been seeking. LINDA: Do people need to know anything about the Kabbalah and Tree of Life to benefit from this layer in your system? MADAM KALI: No definitely not. Initially I wasn’t even sure if I was going to provide the accompanying descriptions of the sephirot and pathways with the sets but clients began to express a keen interest in what I had developed so I decided to push forward with it. I always encourage people to integrate their own creativity and personal connection in how they work with sound. When I read this I realized that is what my premium bowls offer people. The reference to the mandala brings the overtones of the Buddhist principles of compassion, love and protection. While the structure of the Kabbalistic teachings provides a map of how we can navigate our spiritual evolution yet within a foundation of unconditional love. An interweaving of these great mystical teachings. So whether people are aware of it or not, the bowls are infused with much sacred energy and intent. There is no need to believe in this system or follow it any way, the mystical energy of the bowl will guide its owner in whatever way necessary for their personal spiritual development and each person will choose the perfect bowl or set for them at the perfect time. This is the magical mystery of life. LINDA: Finally, can you summarise the main reasons why you believe people should embrace sound healing. MADAM KALI: I perceive that a large part of the imbalance of modern society is due to our disconnection from the natural world and the primal elemental forces by which it is governed by. This disconnection has created drastic imbalances in the both the natural environment and the environment of our own beings. The emphasis on development, growth and consumerism comes at a great cost to our peace of mind and even kindness towards each other. In many ways our behavior reflects a devaluing of what is vulnerable and sacred and this is hurting us greatly. I believe the emergence of the Tibetan bowl at this time in history and the Western worlds growing fascination with its healing vibrations represent somewhat of an antidote to our emphasis on achievement. When played the vibrations of the bowl can transport us immediately to a place beyond time, a place where we can rest without expectation and simply be. Here in this place magical transformation can happen. What experience have you had with sound healing? Did you find it effective? Has Madam Kali’s explanation of how sound produces a healing effect inspired you to try it? We’d love to hear from you!